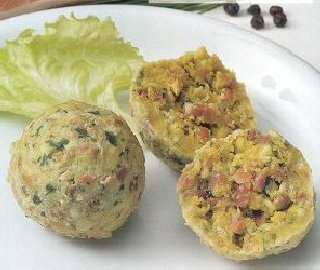 Canederli with speck is a traditional yummi Italian recipe of Trentino in the North of Italy. They are close to the kind of gnocchi made with stale bread. Pretty apprecciated in the autumnal and winter seasons, again this is a great peasant traditional recipe. Many kinds of canederli are out there: the basic ingredient is the stale bread with the addition of others like speck, cheese, spinach, mushrooms and so on. Stuffed of fruit, sweet canederli can be served as dessert.Today we will present you the recipes of canederli with speck: old michetta are the best for this recipe, but of course you can substitute with other type of stale bread; but try to find and use the speck of Trentino. The broth has to be from meat. Preparation will be around 2 hours, but cooking time only around 15 minutes. For the wine, taste the nice red Alto Adige Santa Maddalena Doc. Start and prepareof broth of meat: peel and clean carrot, potato, onion and celery, place them in a pan with the meat and boil in the water for about 1 hour and 30 minutes. Now prepare the canederli: cut the bread, put the small squared pieces you have nicely cut in a large bowl, mix everything with the egg, the milk, salt, and black pepper. The mixture has to still for about 1 hour. Now the speck: chop the onion and put it in a pan withthe oil, fry a bit and add the speck cut it in small pieces. Cook about 5 min. Cool the mixture of speck and then add it to the bread with parsley, flour and nutmeg. Let the ball of mixture stand for 30 min. Boil water for canederli. Roll little ball with your bared hands and… start add them in the water; if the canederlo breaks apart, add some flour to the mixture! After cooking them carefully, drain them and place them in a platter with the broth. This entry was posted on Tuesday, July 24th, 2012 at 7:54 pm	and is filed under Italian Recipes and Food. You can follow any responses to this entry through the RSS 2.0 feed. You can leave a response, or trackback from your own site.